CRAZY DISCOUNT! Was: $249.95 Now: $149.98! Its powerful and efficient 62cc 4.5hp 11,000rpm EURO 2 2-stroke petrol engine is integrated with an air injection carbie to not only add power but provides an option to use it in anti-freeze mode in extreme cold weather. 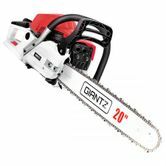 And new to this chainsaw is the innovative e-Start system that allows instant firing up of the motor with minimum fuss. Just pull the chord and you're good to go. An auto-throttle locking and upgraded air filter and inlet manifold also help to ensure stress-free high performance. Holding it up, you'll appreciate the balanced weight distribution design and double recoil combined system for ease of handling and control for long periods of use. Your shoulders, hands and arms will thank you for it. The robust 20" bar and chain will make light work of any sawing tasks and for extra safety, an automatic braking system (which can be manually operated too) instantly stops chain rotation when a kickback occurs. Not least, the chainsaw is built to allow easy access to the engine, filter and spark plugs for quick troubleshooting and maintenance. You'll also get all the necessary accessories for a good clean cut such as a chainsaw sharpener, maintenance tool set, gloves and ear muffs. 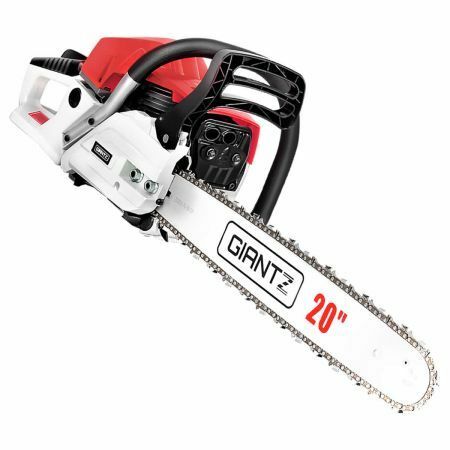 Every inch of the Giantz Chainsaw spells heavy duty high performance. And with it, you're cut out to be too.